While a large part of the overall dining experience has to do with the food, it's not the only thing that matters. Ambiance — from the furniture, to the lighting, to the decor (especially wall paint) — also plays a huge role. 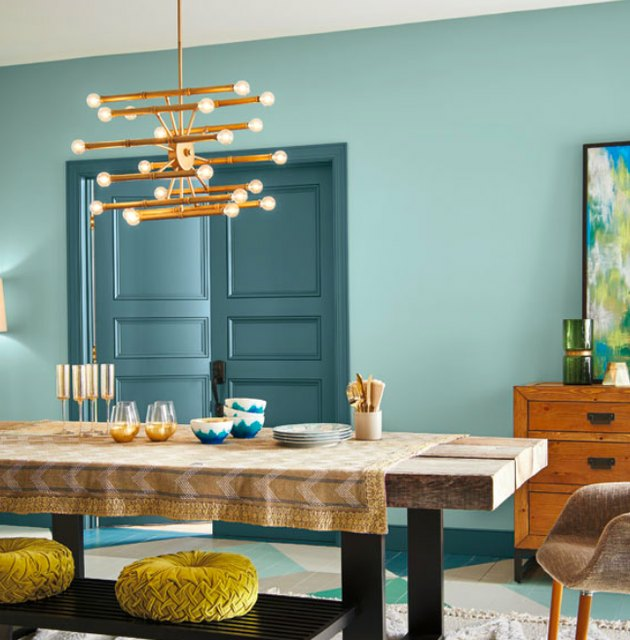 But when it comes to finding the perfect color to paint your dining room, the number of options can feel a tad bit overwhelming to say the least. But take it from us blue is a classic choice. 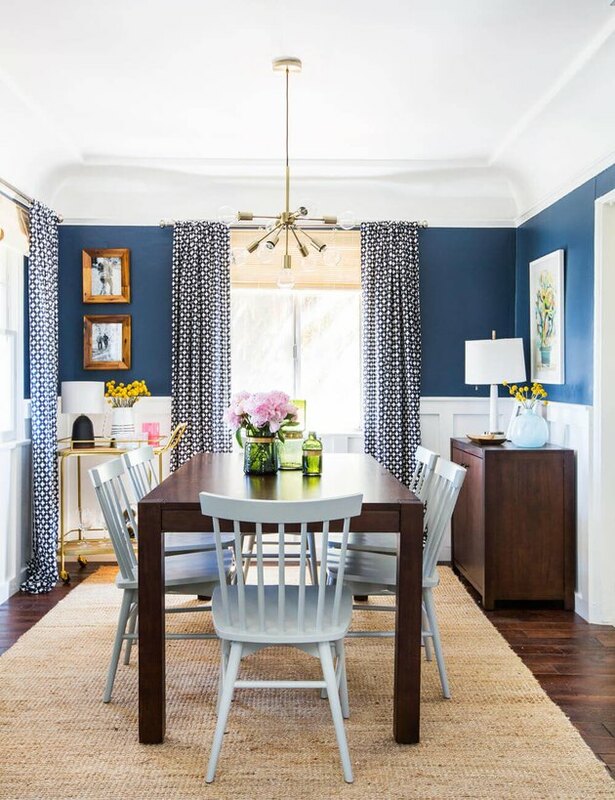 And for your consideration: We are sharing 13 of our favorite blue dining rooms to inspire your striking color transformation. 1. Marry midcentury charm with a rich shade of blue. Interior designer Ginny Macdonald's cozy blue Pasadena dining room exudes midcentury modern flair thanks to mismatched dining room chairs and a few other key pieces of wood furniture. In contrast, the white tulip table and white-painted ceiling and trim add some much-needed brightness. 2. Try a two-tone look. 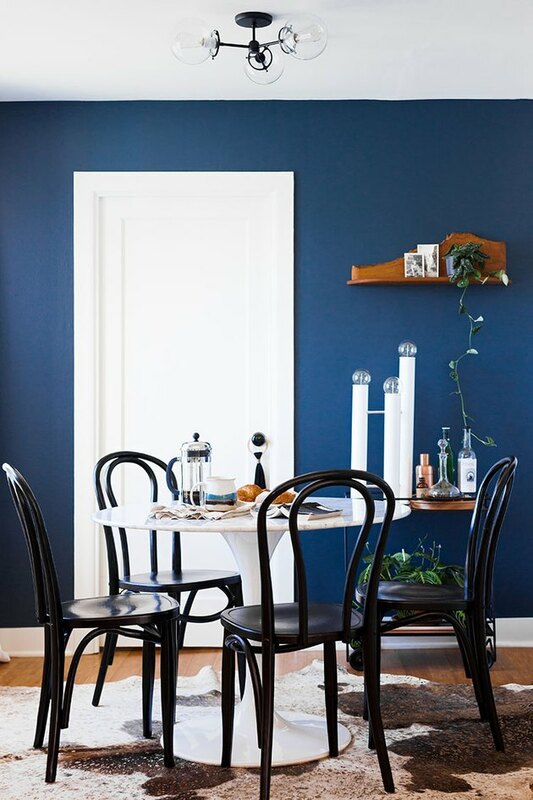 The color-blocked wall in this dining room by Oh Joy! features complimentary shades of blue, which is a great way to incorporate even more of your favorite hue. 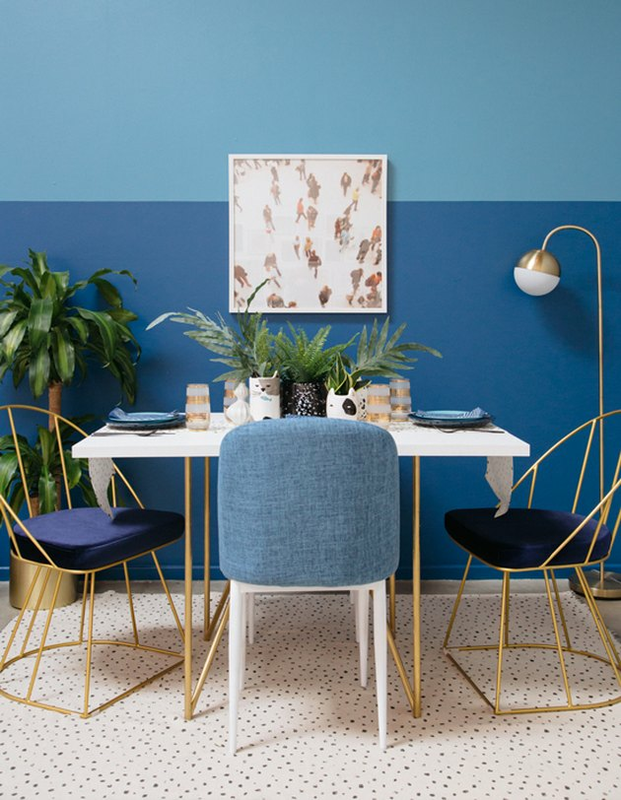 Plus, it makes mixing-and-matching additional blue accents — like these gold frame dining chairs with jewel-tone blue velvet seats — even easier. 3. Opt for a dark blue-green for added elegance. 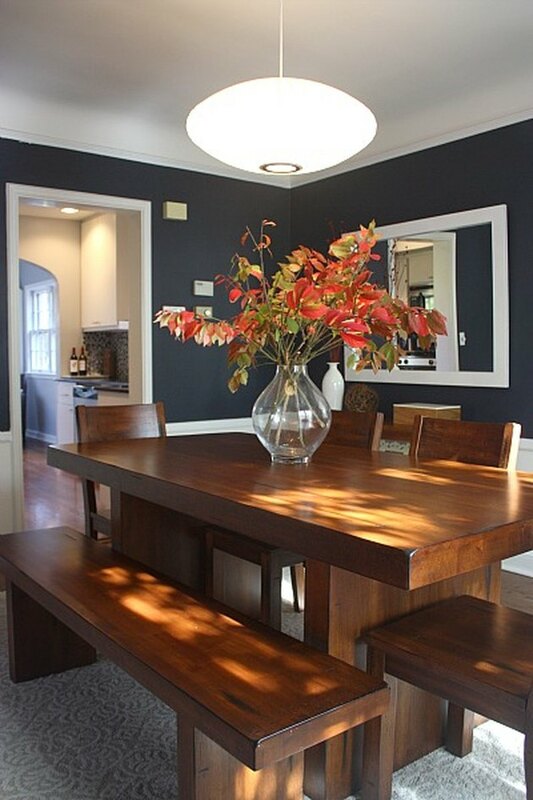 Add instant elegance to your dining room by opting for a dark and dramatic hue. CC and Mike complimented their new blue-green walls with high-back chairs and a modern pendant. 4. Reflect the light with a high gloss finish. A small round table is a smart space-saving option for cramped dining rooms. 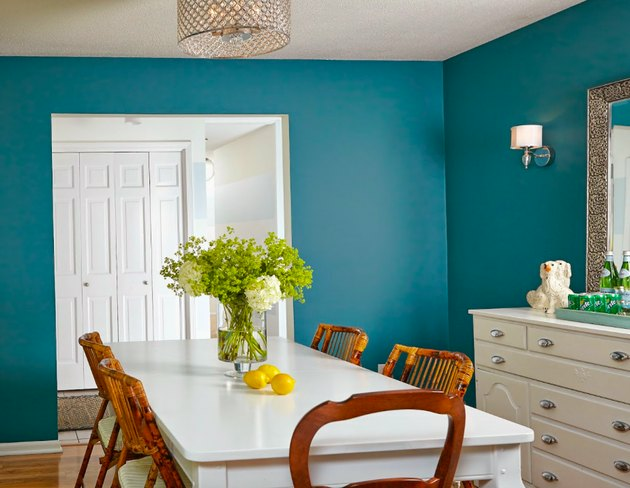 And even though the walls in this Atlanta dining room designed by Keven Francis O'Gara from Thou Swell are darker blue, they're painted in a light-reflecting high-gloss finish which keeps the room from feeling too enclosed. 5. Vibrant blue-green is an ideal backdrop to mix-and-match dining room furniture. When it comes to your dining room table and chairs, don't feel like you have to stick with a matchy-matchy set. Not only is a more eclectic look trendy, but mixing furniture pieces with different shapes, styles, and finishes like interior designer Abby Manchesky did in her dining room, adds layers of interest. 6. A coastal blue works well with dramatic accents. 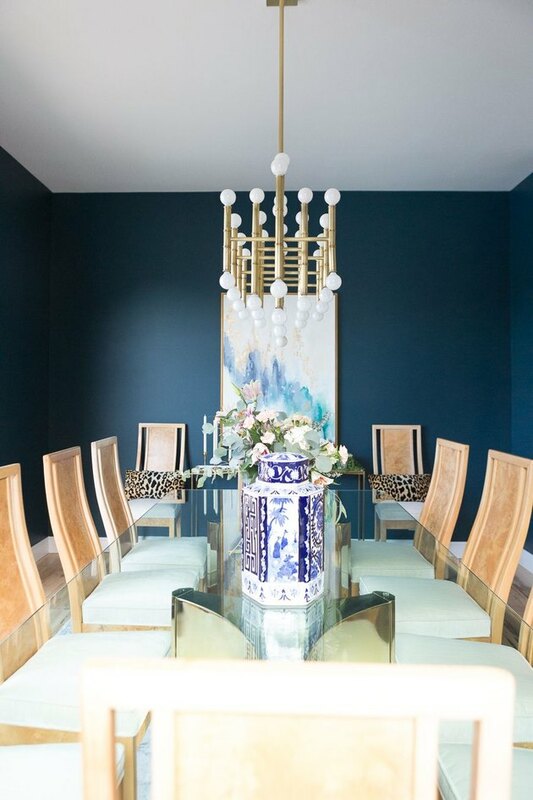 Erin from House of Jade Interiors successfully mixed modern with traditional in her dining room, by painting a rich blue hue above the white wainscot. 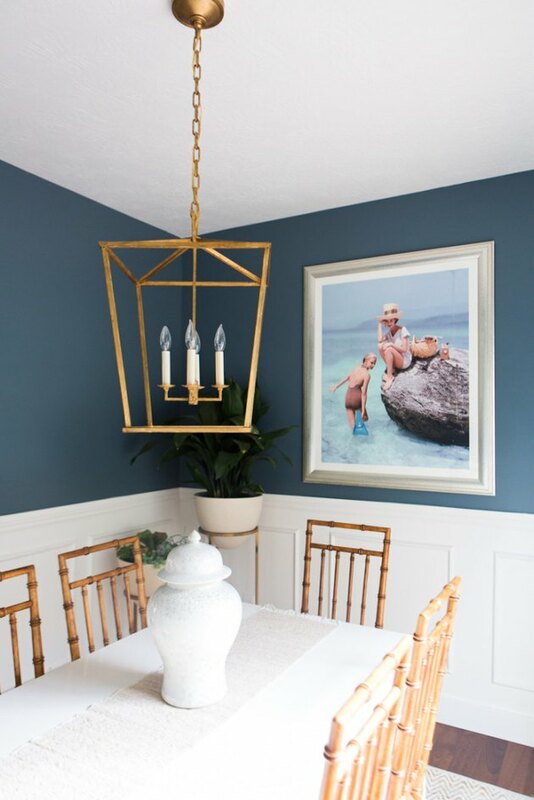 The dramatic lantern style pendant and retro beach day art print add a hint of glamour. 7. Paint the doors and trim blue, too. 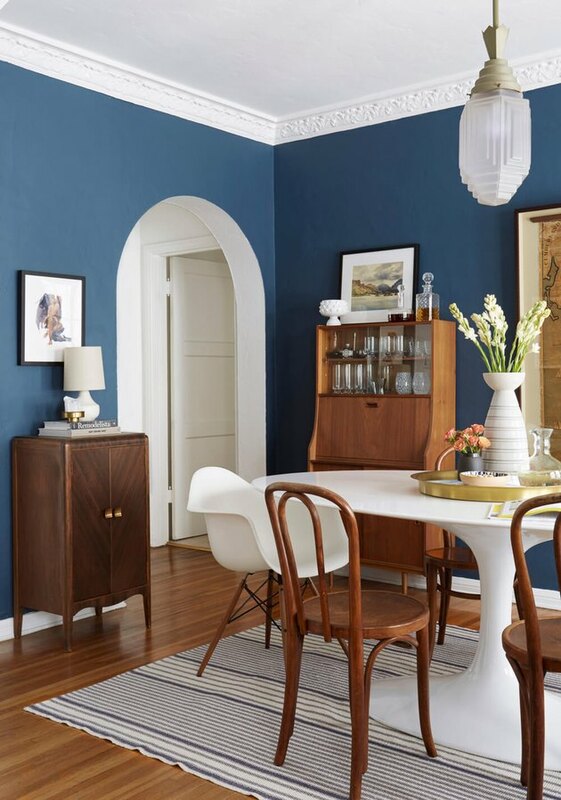 Go all in with your blue dining room decor by painting the doors and trim a complementary blue hue. Opt for a slightly darker shade to emphasize pretty paneling or details and help tie the rest of the room's color palette together. 8. Create playful contrast with a bright blue hue. 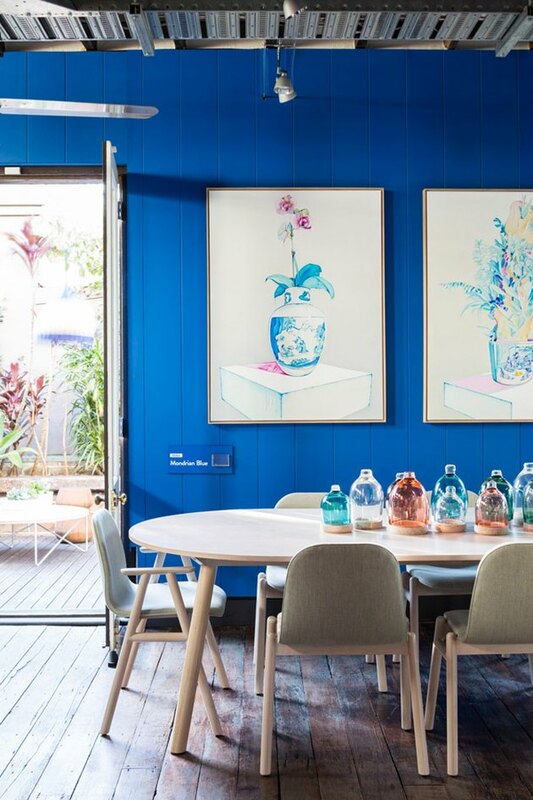 The creative team over at The Design Files created this bright dining space for their open house in Sydney, Australia. The vibrant blue walls add an eye-catching playful contrast that captivates. 9. 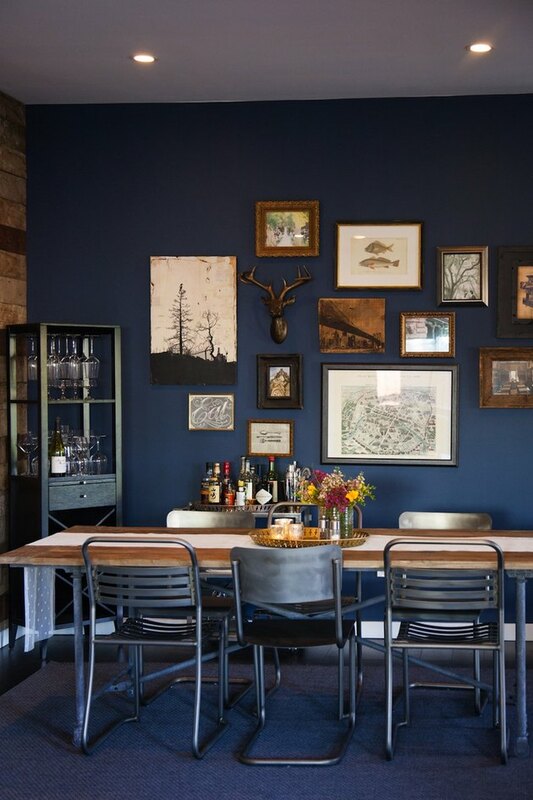 Navy blue-gray walls and metallic accents are picture-perfect. 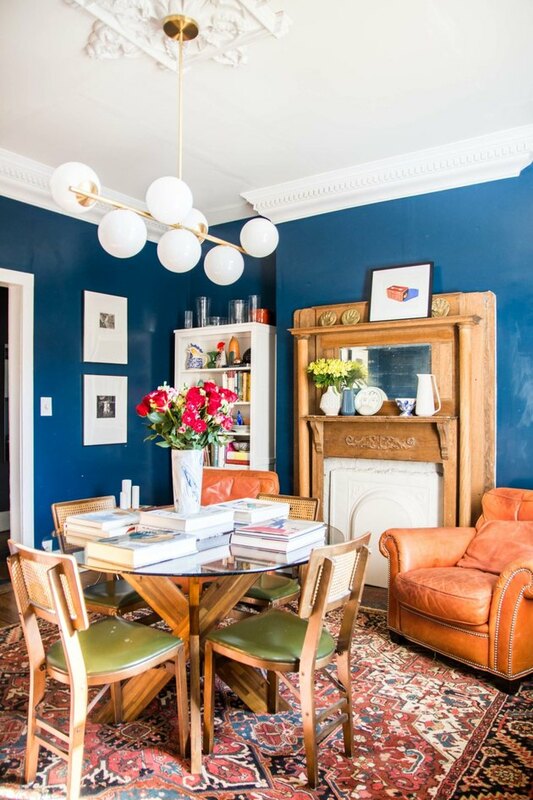 Every space needs a metallic accent, and your blue dining room is no exception. In this L.A. dining space featured on The Effortless Chic, an assortment of metal chairs adds an industrial chic touch. 10. Highlight dreamy blue walls with blue drapery. Classic drapery panels help bring the white wainscoting and dark navy walls together in this L.A. home designed by Emily Henderson, giving the space a fresh and modern look. 11. Bold navy blue and black amp up the drama. Why stop with blue? Add chic black accents — like the bentwood dining chairs and ceiling fixture in Joanna's dining room — to amp up the drama and sophistication. 12. Brighten things up with an eye-catching light fixture. 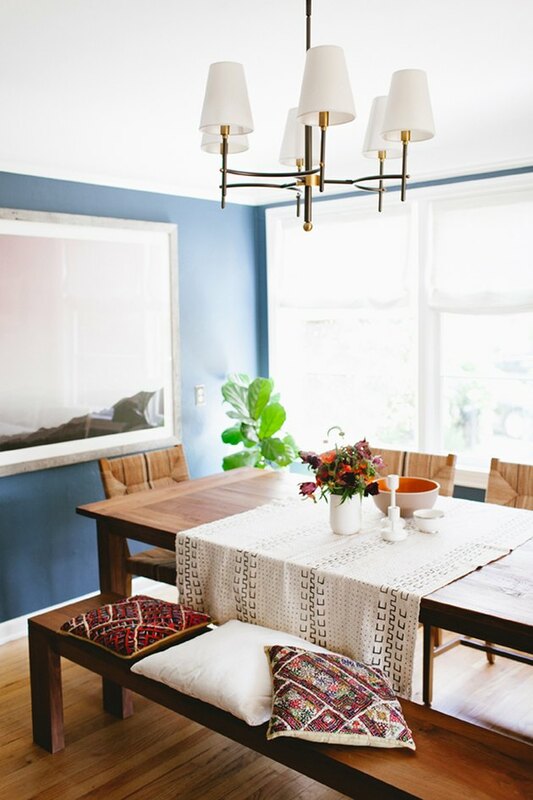 Since dark blue dining room walls add drama and depth, wake up your space with a bold and airy light fixture. 13. Consider pairing warm boho style with a hint of cool blue. For a more laid-back dining room look, Coco Kelley added a long bench — in lieu of individual chairs — to create a casual bohemian vibe that's totally kid-friendly. Plus, you can swap out the pillows regularly to keep your space updated.